It was a different demand from birthday boy this year.No cake at all,can you imagine! !Well,he had a reason after all.We had a party at home few days back thrown for Ajay's colleagues in our new abode.We ate so much brownies and ice-cream that we just couldn't imagine making/eating anything sweet for the next few days. But what's a birthday if there's no cake?As most of you know,I am wary of baking sponge cakes.Have tried it a few times before,some resulting in flat cakes and sometimes hard discs.This time,I was short of time and the oven was not behaving well too.I am yet to get used to the new oven and the icing on the cake was the power outage right during half time. I didn't give up and went ahead with the flat cake.Whipped up the cream in my food processor which took less than 5 minutes to whip and hold shape.Finished off with some pineapple slices and kept my fingers crossed till we cut it.It wasn't bad after all.The texture was of course wrong(it was a bit grainy/coarse) but it tasted delicious,now I know how it feels to bite into moist cakes made at home. Update - I am surprised that few anonymous commentators feel that if the texture is wrong,the whole dish goes kaput!Really?I did a quick Google search just to confirm the texture of sponge cakes.Many recipes state that even if the cake doesn't rise much it is fine since you'd be filling it up with cream or any other filling of your choice.The cake took to the moistening syrup well and remained moist.If you look through the step by step pics,you'll know the texture to an extent.I could still cut the cake horizontally into two in a decent size.Probably if I had used an 8' pan,it wouldn't have come out as flat. Preheat oven to 190C.Line a 9' round cake tin with parchment paper. 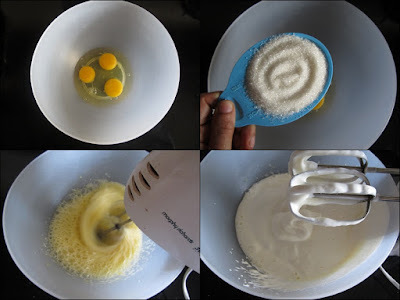 Beat together the eggs and sugar for 10-12 minutes on medium speed till it becomes pale and triples in volume. Drizzle in the vanilla extract. Spoon in the flour 1 tbsp at a time and fold in gently using figure eight moves to ensure you don't release the air. 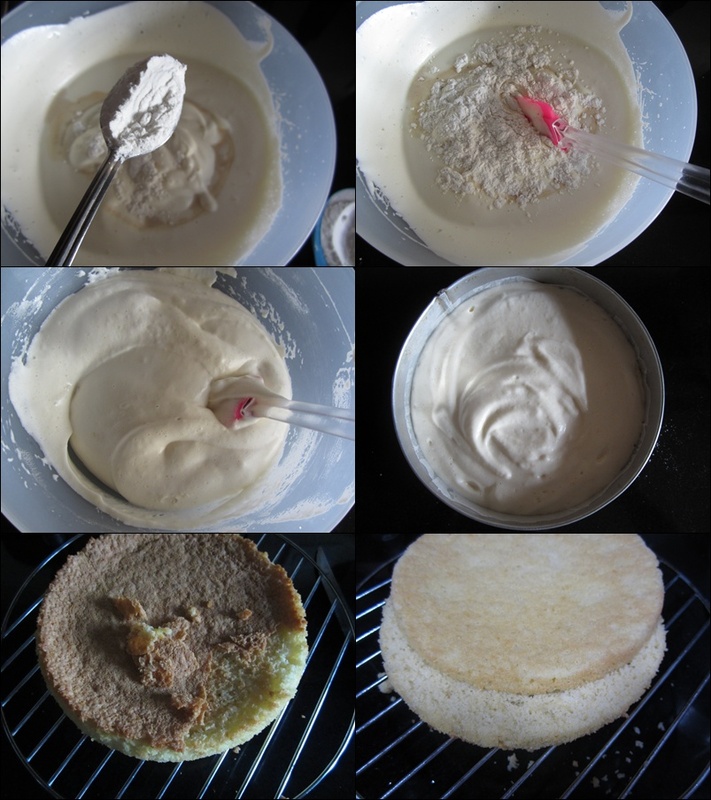 Pour into the prepared tin and bake for 30-35 minutes or till the top becomes golden brown and the cake springs back when touched. Peel off the parchment,let the cake cool completely and trim off the crust and cut the cake into half horizontally. 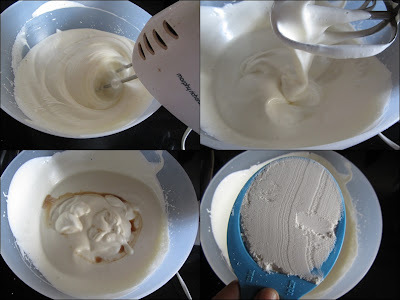 Whip the cream in a food processor for 2-3 minutes till the cream forms peaks and holds shape.Mix in the sugar and vanilla extract and keep chilled. 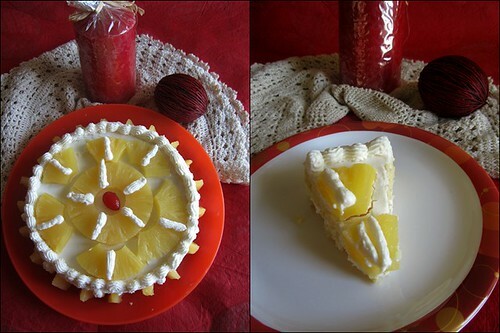 Keep 2-3 slices for decorating on top,chop the rest of the pineapple into small pieces. In a serving plate,keep one layer of cake and drizzle the pineapple syrup on top.Brush some one the sides too. Top with 1/3 of the cream and chopped pineapple. Cover with the top layer and 1/2 of the cream. 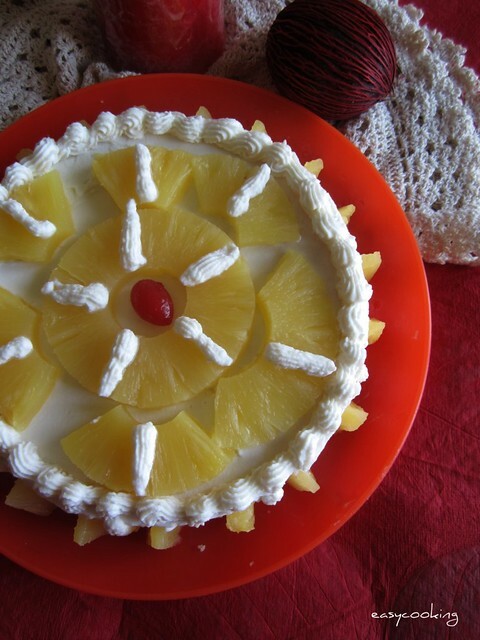 Decorate with whole pineapple slices and whipped cream swirls on top. Love the decoration. it looks awesome ..
lovely treat for your son..sure he loved it! I am really sorry to say this but a flat cake only tastes like a flat cake! Not like a homemade moist cake. If you don't yet know the difference, I don't know what to say! This is the most ridiculous thing I have ever read on any blog! LOL! Looks lovely. I love citrusy cakes. Happy Birthday,Ajay! Enthayirunnu bhaki special? Divya, your cake looks lovely!! 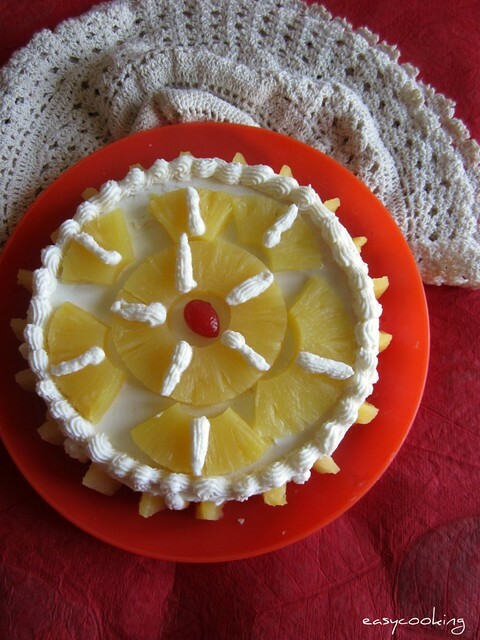 I just picked up a tin of pineapple slices and plan to bake this cream cake for a friend's birthday. You have used amul cream for the frosting and whipped it in a food processor. I don't have a food processor with me and tried whipping amul cream in an ice bath using my morphy richd's hand blender, but it never formed peaks :(. Have you tried whipping it with a hand blender, plssss tell me if you've been succesful in getting it to form peaks? Waiting to hear from you before I make a second attempt.